Retro photos and cameras are currently one of the hottest trends, but why? The popularity of old-fashioned style pictures and retro-looking cameras has been growing quickly. From apps to film cameras, retro seems to be all the rage. A bit like vintage clothing, old-fashioned photography is becoming ever more popular and desirable. Instagram has been sweeping the news headlines, what with it being snapped up by Facebook and merging with Hipstamatic. It has perhaps highlighted the increasingly popular trend for retro photography, which seems to be powering through the industry and the world. Grainy, saturated images appear all over Facebook, and Fuji even reported that the sales figures for film are not decreasing as they first predicted. But it didn't all begin with Instagram - it just caught the wave of the existing trend. Perhaps one of the initial emergents of the recent retro photography trend was Lomography's range of film cameras, such as the Lomography La Sardina and Lomo Sprocket Rocket. Living for the 'point and shoot, just capture the moment' element of photography, these cameras produce instant film photographs with that aged, saturated look that is so desirable at the moment. Photographer Peter Hong said: "I guess the main thing that pulls you into retro photography is probably the fact that it is different. "We live in a world where we demand perfection. New cameras have got to be pin-sharp, well built, fast, ergonomically friendly, and so on. Retro offers the opposite. Film cameras aren't perfect; they aren't sharp. There is an excitement with film, of not knowing what you have taken until you get it developed," he explained. So what's on the market for those who yearn for the smell of film and aesthetics of instant retro photos? Lomography is perhaps the first port of call. 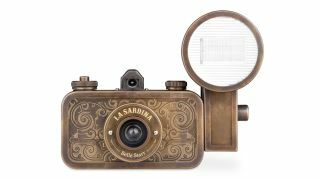 Its latest range includes LomoKinoScope, Lomography Fisheye One Blue, Fisheye One Green and La Sardina Camera & Flash - Belle Starr, all of which are available to buy right now. Another popular competitor on the film market is the Fujifilm Instax Mini 7S, which produces the similar instant toy camera-style photography. Film isn't for everyone, but there is a wide range of digital cameras that are harking back to days of old with their designs. If you want a DSLR disguised in film's clothing, then the Fujifilm X100 is dressed in a black leathery coating over a silver frame, giving it that all-important retro look. A spokesperson for Fujifilm explained: "The retro design of the X100 was inspired by the functionality and ergonomics of cameras from the past." Adrian Clarke, senior vice president for photo imaging at Fujifilm, said: "I think people loved the styling of it, they thought it was a great combination of smart retro looks." Another camera to consider is the Fuji X-Pro1. Again it encompasses the retro style, and also has a traditional aperture ring and shutter speed dial. The Olympus OM-D E-M5, meanwhile, harks back to the 1970s and its own original OM range. Panasonic on the other hand, told us that it tends not to produce retro-looking cameras because it's a new brand and is keen to be taken seriously in the photography arena. If inner beauty is more your thing, then there are a number of cameras available that have artistic filters. The Olympus PEN Lite E-PL3 has a modern look and creative filters that enable users to give their photos a grainy film finish or the old-fashioned pin hole camera look. This also applies to the Olympus PEN E-P3, which has an added Cross Process filter for recreating an old film processing trick. The Samsung WB700 has an interesting array of artistic filters, including vignetting, Old film 1 and Old film 2. If you're looking for a compact camera with a bit more punch, the Panasonic Lumix LX5, offers filters called Retro, Pin Hole and Film Grain. It's no surprise that the phone industry noticed this retro photography trend and decided to join in. The iPhone offered up Instagram, an app that is now extremely popular and has recently also been made available for Android. By installing Instagram, mobile users snap a picture using the iPhone's camera and then select a certain type of filter to apply to the photo. The photo is then intended to be shared across the social media platforms of Facebook, Twitter and Tumblr. Retro style photos appeared all over these social networks, demonstrating the love for the old-fashioned style of photography. Its popularity grew with the recent merger between Instagram and Hipstamatic, to produce an advanced editing and retro photo sharing experience. Hipstamatic had essentially the same idea as Instagram, enabling users to create retro-looking photos that could be easily shared among friends. Instagram CEO Kevin Systrom explained that: "A trend was emerging in users editing their photos with Hipstamatic before uploading to Instagram - and establishing such a partnership made sense." With the trend for retro photography still growing, it's worth hedging a bet that the market will see more apps and more retro cameras in the future.